Those of you who know me well know that I am not a winter lover. In fact, for many years I dodged the dreaded Canadian winters by taking contracts in the southern parts of the US. A winter spent in Arizona and another one in Southern California were very good for my soul. I’m much happier wearing flip-flops than snow boots. And yet, in the middle of March I spent 2 weeks traveling thru Norway, Sweden, Finland, and Denmark with my kiwi sidekick. For the last few years the Lofoten Islands have been a place I’ve been drawn to. A big part of the draw was how picturesque they are, but equally so is their isolation. Especially, in the winter. 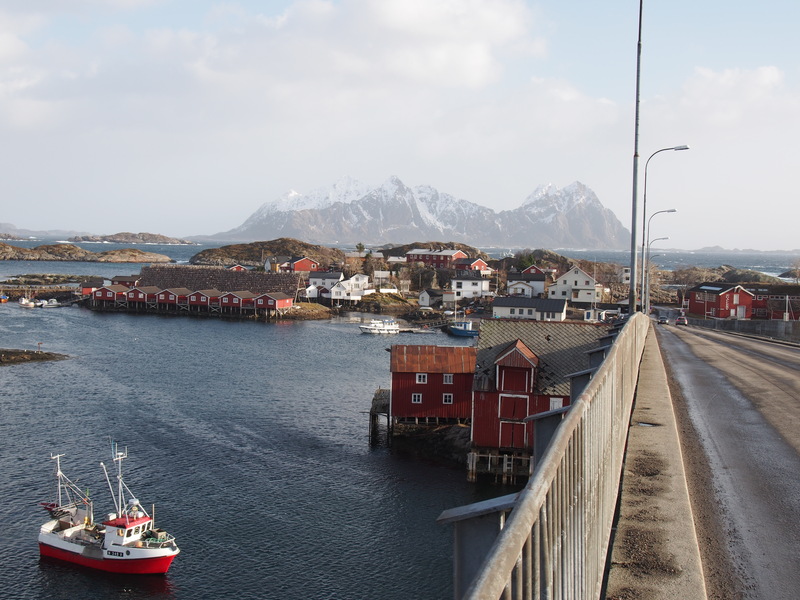 The Lofoten Islands are a chain of islands off the northern Norwegian coast located in the Arctic Circle. To get there we flew from Riyadh to Munich, to Copenhagen, to Oslo, to Bodo where we spent a night. Bodo is the main transport hub for tourists heading to the Lofotens. 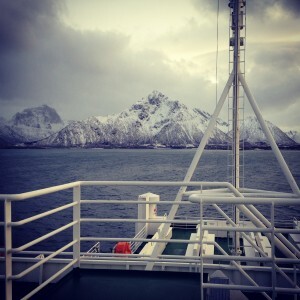 The recommended route to get to the Lofoten Islands is to take an express ferry from Bodo which takes about 4hrs. The ferry, however; runs at odd times, and doesn’t get into Svolvear until after dark so we decided to take the bus. There are a couple different bus options. 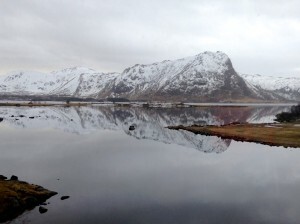 We switched buses in Sortland, and it took us most of the day to get to Svolvear. The buses in Norway are clean, and efficient. To get to Svolvear you end up taking a couple ferries while on the bus, and it’s a very beautiful journey. One of my favourite things about traveling is being in motion. I love to take the world in from a window of a bus or train as opposed to flying. This was a lovely bus trip. The scenery outside is a combination of utter beauty and the harshness of desolation. The grey winter sky contrasts against the snowy jagged cliffs as you pass lakes and the coastline of the Norwegian Sea. Svolvear is one of the main towns in the Lofoten Island archipelago. We decided to stay here 4 nights as the town looked very quaint. You can see most things within the town in a day. There are several cute shops, and a bunch of galleries with photography exhibits and more traditional style paintings. There are many food options. There is a large bridge with amazing views that crosses over to the small town of Svinoya. This is a great place to take photos of the massive fish drying racks which are a major contributor to the areas economy. 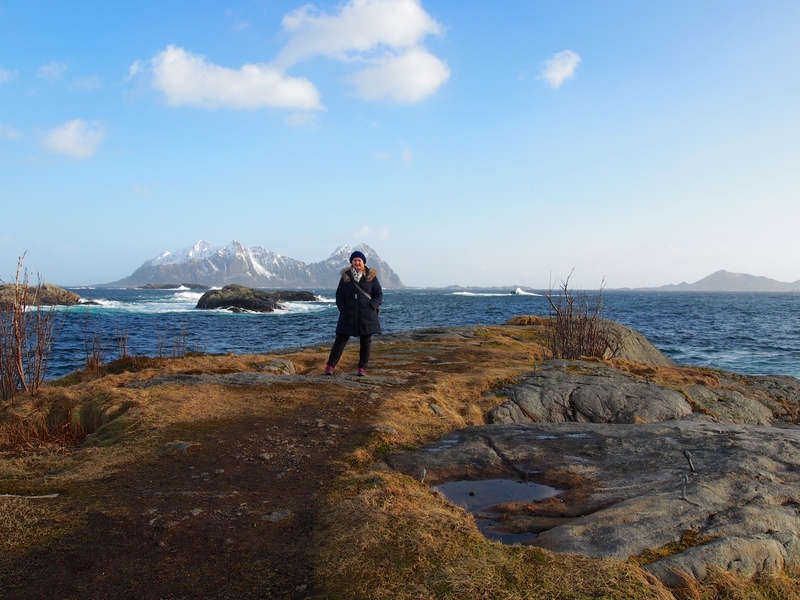 We took a day trip to the opposite end of the island to a place called Henningsvaer which you can easily walk around in a couple of hours. The buses don’t run often so you really have to plan your trips out well in advance. The best option (but also the most expensive) would be to have a rental car, but we were trying to stay within our budget, so the bus it was. Another easy day trip is to take the bus to the next island south to visit the Lofotr Viking Museum in Borg. 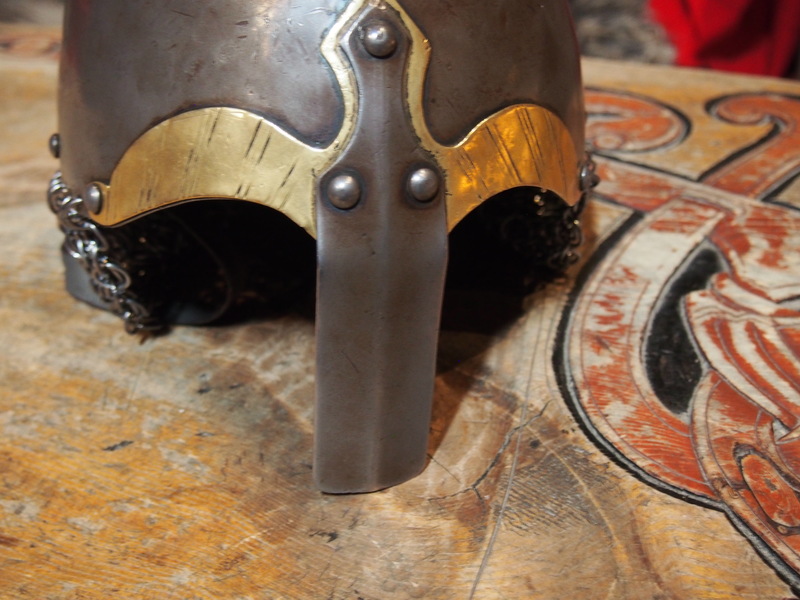 The museum tells the Viking history of the area and is build on an archeological site. There is a reconstructed Chieftain house where you can try on armoured clothing and see what it would have been like to live during Viking times. During the summer months you can go on board a Viking ship- this area was closed while we visited as the lake was frozen. 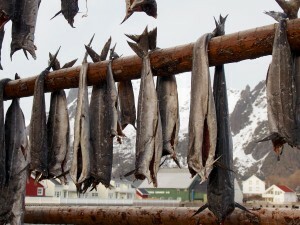 There are many other activities to do while in the Lofotens. You can go on a whale expeditions, go deep sea fishing, or surf the Arctic Circle. There is limited day light hours thru the winter months but in the summer you can take in the “midnight sun” with extended hours of daylight. From the Lofoten Islands we traveled to Narvik, again by bus which took about 4 1/2 hours. Narvik is a great transportation hub for those tourists traveling onwards to Sweden. There is a ski hill over looking the city, and many shops and restaurants to explore. We spent one night here before taking the train to Kiruna Sweden. Norway wasn’t the easiest place to travel in as several times we ate at restaurants that didn’t have English menus or staff that didn’t speak English. I often thought how difficult it would be if English wasn’t your first language seeing as we had a lot of communication difficulties. That being said, Norwegians themselves are very friendly. Especially the elderly ones. We often had elderly people come up to us and start chatting in Norwegian only to have us smile and shrug our shoulders to communicate that we didn’t understand. It’s also good to know that in a lot of pubs or simple restaurants you go up to the counter to order and pay prior to getting your food. Tipping is not expected at restaurants like this. The buses are easy, but can be a little frustrating as you don’t get tickets ahead of time, which means it takes several minutes at every stop for people to board and pay for however far they are going. 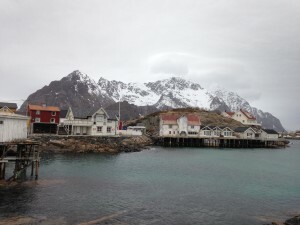 The Lofoten Islands are as beautiful as I imagined. I would happily go back! Great photos as ever!! Very cool! See I really do read your blog!! Thanks for following along Cathy!! Nice. I am visiting Norway again this year and that will be during the hajj holidays. I’m in riyadh btw. Where in Norway will you be going? It’s such a beautiful country- I imagine I’ll be back as there was a ton I didn’t get to see! Hey Kristine, I was in Oslo and Bergen last year, October, for 2 week just roaming the cities. This year, my plan is to visit Svalbard. a place near where just visited. whenever i got hungry i just dropped by 7eleven for baconpolse lol. I just had to google where Svalbard was- it looks quite remote- I imagine it will be beautiful!! We definitely ate our share of bacon wrapped anything when we were there! Norway is, by anyone s standards, one of Europe s most beautiful and awe-inspiring countries. Its unhampered landscape and pristine wilderness promises to delight those with a love for the natural world. 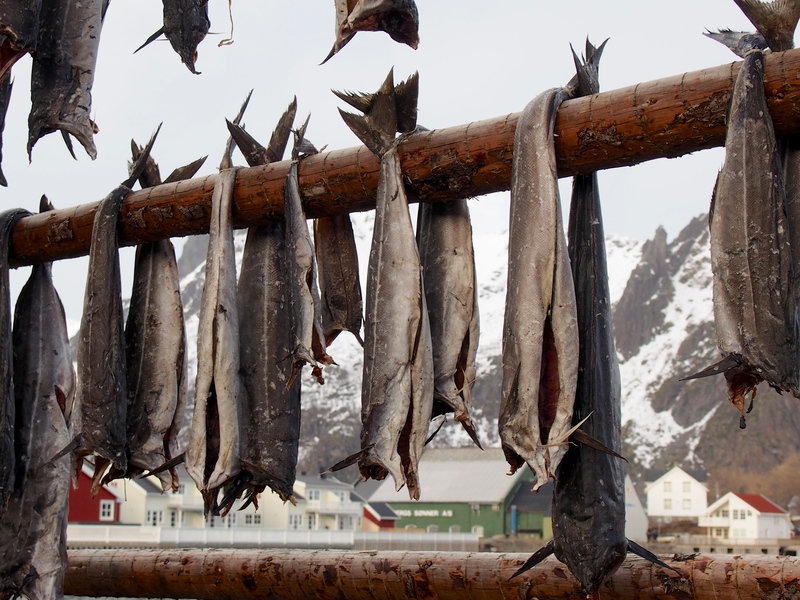 Join us as we voyage from Scotland to Norway and along its western coast which is punctuated by seemingly endless beaches, bustling coastal towns, fjords of cinematic grandeur and thriving fishing communities.